This article was originally written by Anna Rzewnicki and posted on the Poole College of Management website. “Both Paul and Steve have played an integral part in the growth and recognition of the Poole College of Management. 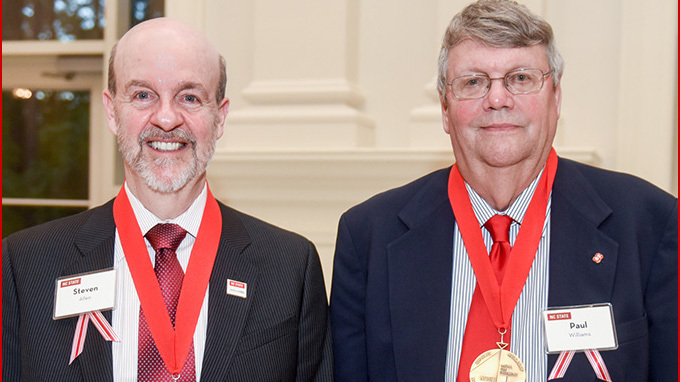 They are most deserving of this honor and we at Poole are proud of their accomplishments nad honored to have them as colleagues,” said Ira Weiss, dean and Stephen P. Zelnak Jr. Chair. At NC State, Allen has had a leadership role in developing graduate management education. Under his direction, the college’s flagship master of science in management program, which had 175 students, was transformed into an MBA with a rising reputation and a current enrollment of more than 500 students. In the past year, NC State’s Jenkins MBA has been ranked as the 9th best online MBA by US News, the 29th best full-time MBA by Bloomberg Businessweek (up from 54 two years ago) and the 45th best part-time MBA program by Bloomberg Businessweek.